The Upper East Side is known for its casual and family atmosphere. Beautiful brown stone line the streets and its close proximity to Central Park make many places picturesque. Although known for its serene vibe, it isn’t known for its lively night scene. With that, how does one know where to find a good bar? Now that the area is becoming filled with more young professionals, the bar scene has changed. No Ryan’s Daughter or Dorian’s is not on the list, as both seem to have fallen off (sorry Frat Boys). As a resident of over two years on the UES, I find it only fitting to compile a list of a few of the best Upper East Side bars. The Auction House is one of the many bars in NYC that tries to keep its 1920s speakeasy vibe…but is one of the very few to actually pull it off. With long red velvet curtains blocking its large windows, the bar looks closed to the untrained eye. The door is only marked by a large American flag in the front. As you walk into the bar, you cannot help but feeling like you have stepped back in time. 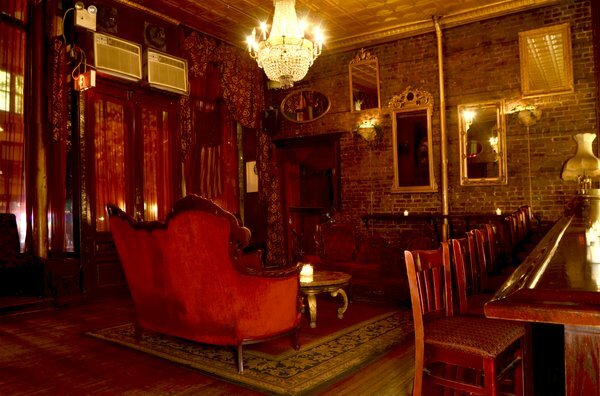 With its exposed brick, dim lighting, and oil paintings, it is the ultimate date spot. If you are able to find it, I highly recommend stopping in for a drink! HOURS: Sunday, Monday: 7:30 p.m. to 2 a.m. Tuesday- Thursday: 7:30 p.m. to 3 a.m. Friday, Saturday: 7:30 p.m. to 4 a.m. 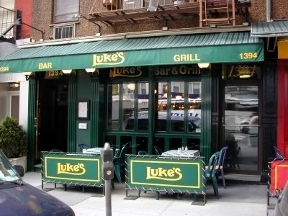 Established in 1991, Luke’s Bar & Grill has remained a staple in the UES. With a small town feel, it’s the kind of place where the bartenders know your name and everyone becomes your friend. This bar is cash only, so be sure to hit the Chase across the street before you head in! With a wide ranging menu consisting of comfort foods such as Mac & Cheese and Fried Chicken to healthier options like the Turkey Burger, you’ll get the hometown feel and price. Why not indulge in a burger and a pint, watch the game, and meet a local? Located off 3rd ave between 83rd and 84th street, the Gael Pub it is the ultimate irishs bar. There is always a great selection of bars on tap. They have Trivia Tuesdays, Karaoke Thursdays, and other weekly specials that make the bar affordable and diverse. As one of the first bars I went to when moving to NYC, the Gael Pub has a small place in my heart. Try out your Bartending Skills on Thursday/Friday nights as the Gael Hosts Guest Bartending. The huge multiple television screens makes it a great sports bar, and you can be sure your game is always on. Monday through Friday: 5 p.m. – 4 a.m.
Saturday, Sunday 12 p.m. – 4 a.m. The ultimate sports bar, “guys bar”, and wing bar. If you’re looking for a bar filled with sports fans, good food, and giant screens, Manny’s is your place. They boast having some of the best wings in New York City, and I think they’re right. The screens all show different games, so no one will be left disappointed. Dress code is very casual, and the atmosphere is relaxed. Perfect for a Sunday afternoon while hanging out with your friends. Sunday-Wednesday: 11:30 a.m. to 2 a.m.
Thursday-Saturday: 11:30 a.m. – 4 a.m.
Kaia is one of those unique places in NYC that makes the City of Lights special. 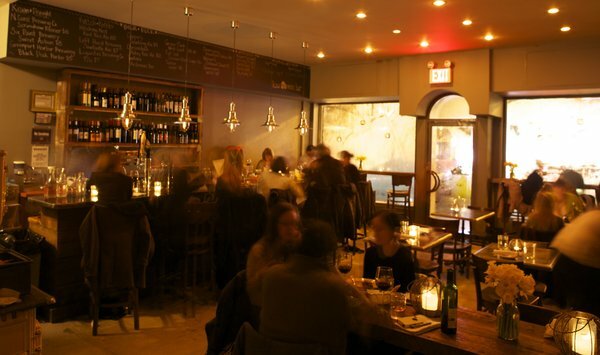 It’s dim lighting and cozy atmosphere make it perfect for a date spot or a night out with your girlfriends. The appetizers are not only unique, but always delicious. In true European resturant style, the service is slower than the normal NYC pace, so not a place to go if on a tight schedule. However, if you are going to talk, drink a glass of wine, and unwind from a long work day, it’s the perfect place. Locally owned, the restaurant gives off a hospitable and welcoming charm; much like that of a relative’s house. The bartenders are friendly and helpful, and give great recommendations. From their array of appetizers and savory snacks, it’ll be hard to pass up a snack. If you’ve already eaten, why not try a dessert? The Cremora Tart is the perfect lemon and marshmallow indulgence to close the night.